This page is a translated version of the page Météore and the translation is 100% complete. The Météore is one of the main historic French brands, its origins can be traced back to approximately 1916 with the founding of the Manifacture Parisienne de PPR. It remained in business until the late 50s when was one of the first historic French fountain pens manufacturers to succumb to the ballpoint pen revolution. First Météore pens were characterized by an overall good quality, certainly in par to the medium level American manufacturers, and its production it's distinguished in particular for the Pullman model with reentrant body, that anticipates Pilot Capless by nearly thirty years. Subsequently, the quality had gone worse, while remaining about the same of the rest of French production. A Météore advertisement from '20s. The origins of Météore are uncertain, the company was founded in 1916 as Manifacture Parisienne de PPR (Porte Plume Reservoir) by L. Demilly (then general manager) and L. Degen (then managing director), based in Nanterre, then become La Plume d'Or in 1921. It is not known whether the company is descended from Franco-British Manufacturing Pen founded by Charcellay in Paris in 1910. 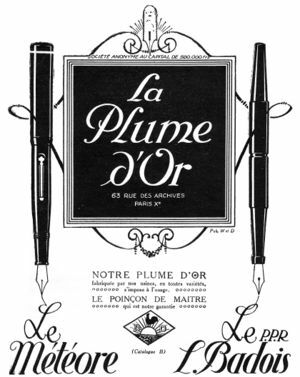 La Plume d'Or was still on the market after the end of World War I, producing two brands: Météore and L. Badois, and also for third parties. The second brand is linked to the activity of Luis Badois, holder of fountain pen patents both for his own then jointly with the 'La Plume d'Or. The Météore first models were black or marbled hard rubber eyedropper or safety pens, similar to those of other French manufacturers of the same era, to which they added laterlever filler models. The first pen clearly associated with the brand was introduced in 1922, was characterized by incision of the Météore name on the cap, decorated also with a white ring at the top, and had the lever end in the form of a shamrock. The nibs were often marked with the initials (D & D) of the founders. In this period were produced safety or lever filler ebonite fountain pens in two dimensions for both men and women. Model names of this period are Zodiac and Prompto. The company switched to celluloid quite late, a second set of models was launched in 1932, keeping the lever filler but with a washer clip and two rings on lower edge of the hood, over the classical one at the top. The pens were black or marbled, but were also produced models in chased hard rubber with overlay in lacquered metal, gold, silver. In 1932 was produced the most interesting Météore model, the Pullman 35, a button filler pen built with a peculiar mechanism, in which the body could be made ​​to slide, by pressing the bottom, inside of the cap. This was equipped with a movable top hinge, which opened thus letting out the tip of the pen and nib. The same concept, even if made ​​with a different mechanism, was adopted three years later by Aurora with the Asterope, and both pens are regarded as the precursors of the Pilot Capless. Aside from the novelty represented by the Pullman model the Météore continued to produce ordinary pens, and generally was quite conservative, maintaining for long the flat top style. Only in 1941 slightly tapered lines were adopted but, with the war going on, restrictions led to the use of steel nibs rather than gold. The models of this era were called Prior, Selection, Record and Pullman. In 1942, because of the shortage of gold supply nibs were produced in steel, using a metal alloy called Vaedium. After the war the pens shapes were further modified, and made ​​even more streamlined with the Météore 807 model, also the clip was modified, taking a thinner line. Around 1950 were also introduced other models, identified by three-digit numbers beginning with the 3. Then the 800 lever filler series was introduced, with the Météore 827 having an ink level display, and then nibs marked Stabilior began to appear. In 1951 the company adopted, like other French producers, the accordion filler of Stylomine, with the model Pulseur, available in various colors. This system was also used for the pens of the 900 series with nibs marked Stabilior. During this period, the top models were those of the 500 series, with three rings on the cap and the engraved logo on the nib. 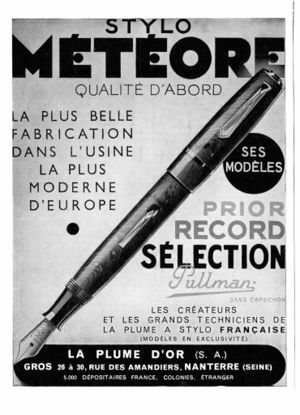 Like all other companies Météore suffered heavily from the effects of the ballpoint pen success, It participated in the production of Pulsapen, but was unable to withstand the crisis and was one of the first big French producers to fail in the late 50s. 1916 the company is founded by L. Demilly, V. Degen in Parigi as Manifacture Parisienne de P.P.R. Brand page on a decommissioned website. ↑ the same pen was produced, in other countries, even with different brands such as Uneman, however referring to the same patent (nº DE-531249) of Leopold Kutter. ↑ the date is indicative and is reported in this old page but it is highly doubtful given that appears in advertising dating presumably the previous year (the dates of the advertisements come from ads and deductions related to the texts cited in the back and are not themselves completely reliable). This page was last edited on 9 January 2019, at 01:55.